The Junior IWGP throne is vacant. 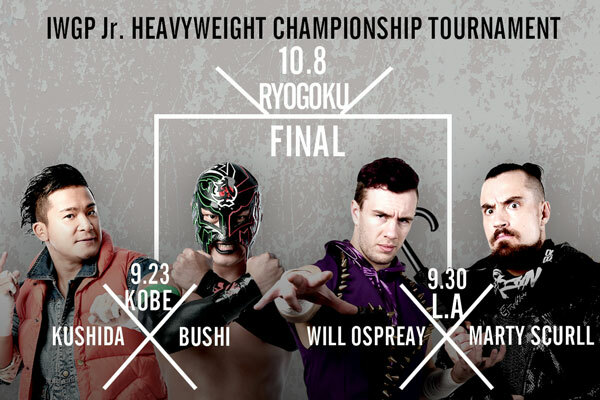 KUSHIDA, BUSHI, Ospreay, and Scurll have all entered the Junior Heavyweight championship tournament! At a press conference on August 20th, a chairman Sugabayashi announced that Hiromu Takahashi relinquished the IWGP Junior Heavyweight champion belt due to injury. He also announced that IWGP Junior Heavyweight championship tournament will be held staring at the next series. All matches will have 60 minute time limit. The first round will be held at Kobe on September 23rd: KUSHIDA VS. BUSHI, and at Walter Pyramid L.A. U.S.A on September 30th: Ospreay VS. Scurll. The winner advances to the final at Sumo Hall on October 8th. Which junior warrior will grab the title and become the new king?